If you presented an offer to a potential private lender, especially one which you consider to be a good opportunity, you are going to want a response. If you presented a thoughtful plan, you will probably get one. The possibility you will get a response will rise considerably if you have already established a relationship with the lender before the need for funding arises. You are also more likely to get a response if you present the offer in the manner in which the lender prefers. How do you learn the lender’s preference? Ask them. That is a key benefit of establishing a relationship. Please remember if your offer was unsolicited, the recipient is not obligated to respond at all. I will almost always respond to a request that comes from an investor whom I have met in person and with whom I have had more than a cursory correspondence. I attempt to respond to all offers which are well presented. However, I often have multiple projects in progress simultaneously and, like most everyone else, I prioritize my time. At times when I have more active projects, I often have less funds available for new projects. Even an excellent proposal would most likely be rejected as I must triage my responses. You WILL get better responses if you make better proposals. If you are making your first contact, the odds I will give a detailed response increase significantly if you are polite and if your correspondence shows you put significant thought into your plan. The odds I will accept your proposal depend more on the type of deal and whether it is a good fit for my current situation. Your proposal must be clear enough that I can understand most of it on the FIRST reading. If you have identified most of the parameters I discussed in Episode 5: “The Deal” AND your deal appears to be a good fit, I may respond with some questions via e-mail. I will tell you the best way to respond. If I haven’t stated otherwise, the way I contacted you is the way I prefer to communicate. Usually I prefer e-mail for preliminary contacts. My schedule is not always traditional. I sometimes take breaks and go places where phone reception is spotty. Also, I often prefer to evaluate deals late at night when there are few distractions. A good proposal sent by e-mail allows me to evaluate your proposal and supporting documents when it is convenient for me. I am willing to spend more time on a less than ideal proposal if I can review it when it is convenient. If I have asked you to respond by e-mail, you may not receive an answer if you leave me a voice mail. Obviously, if we have not spoken via phone before, your number is not in my contact list. I rarely pick up calls from unidentified callers and your message is more likely to go to voice mail if it is not identified. I never pick up calls from “private” or blocked numbers. If your response to my inquiries acknowledges my questions but does not answer them, I may not reply again. In fact, you may have demonstrated it will be difficult for me to work with you because you are not able or willing to follow simple directions. It is not unusual for me to receive a voice mail message in response to an e-mail in which I asked several specific questions (and requested a response via e-mail) that goes something along the lines of: “I received your e-mail and will get you those answers but I just wanted to call and say hello. Please call me when you can.” If I asked questions in my e-mail, I am interested, and am probably in a position to help with your deal, but if I wanted to speak with you, and thought it was the appropriate time, I would have called you. Believe it or not, most of the people who leave me this type of message never provide the specifics I asked for in my initial response. They also tend to not get a response from me. It is always much easier and faster to reject an offer. Don’t give me a silly reason to do so. If I took the time to review your proposal and rejected it, that doesn’t necessarily mean I didn’t think the proposal had merit. It may simply be a poor fit for my portfolio or my funds may be committed elsewhere. If that is so, I will tell you. If you get the project funded let me know how it turned out. That will further our relationship and there may be an opportunity to work together on another project down the road. If you persist too long trying to convince me to reconsider after I have made my decision to not participate in your deal, you may actually be convincing me we would not be compatible business partners now or in the future. In that case, the likelihood that I will give serious consideration to your next proposal diminishes rapidly. In many deals, I start out as a lender but can become an advisor. I desire a profitable outcome for the project. I often have more at stake than the borrower. If I decided to fund your deal, I decided to become your partner. I choose my partners carefully. 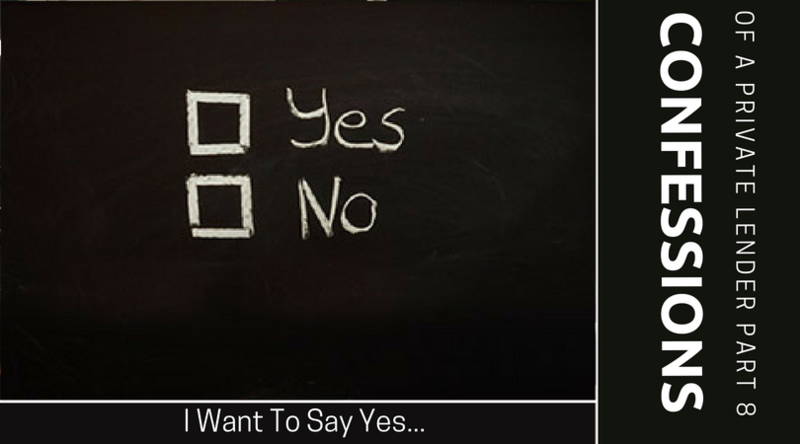 When you present a well thought out plan, I generally want to say yes, but please remember it is much easier to say no. I was pleased to be invited to contribute to this redesigned site. If you would like me to post details of other deals or are interested in other topics, please let me know. If I touch on a subject that interests you and that you would like me to expand on, or if you would like to suggest other topics, please leave a comment and let me know. If you think I have missed the mark completely, go ahead and tell me that also. You won’t make me cry and it may turn into an interesting discussion. Please join the email list, follow on facebook, and add on twitter.